To recompose the outdoor spaces of approx. 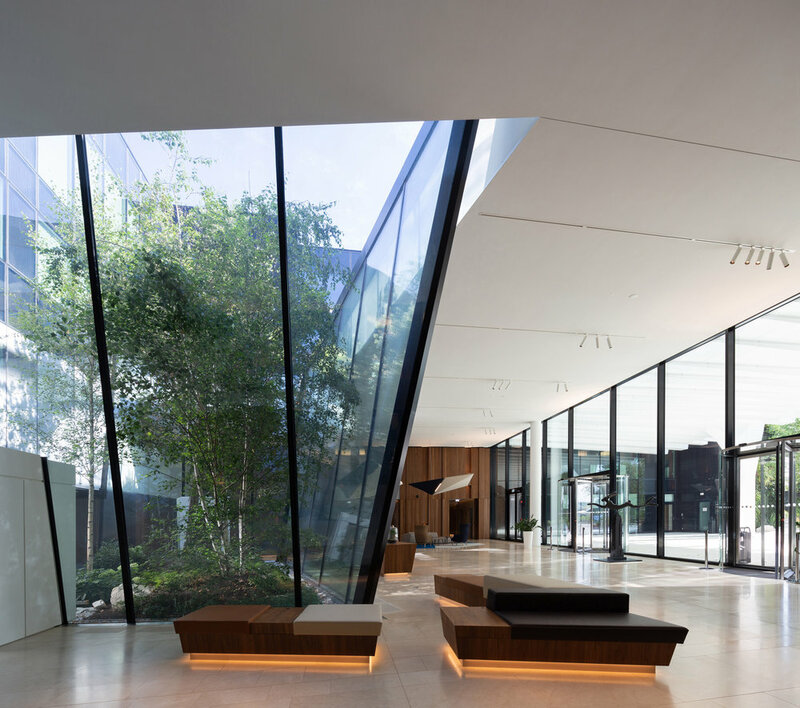 2,000 m2 of Foyer Insurance SA offices in Luxembourg, the Agency Christophe Gautrand & Associates offers to bring nature into the heart of offices. The project links gardens to each other through a common aesthetic and a singular image of nature. The lines and the proportions are purified, the light and the notion of emptiness are highlighted. The open-form gardens evoke undergrowth landscapes and vast grasslands of perennials and grasses. True small open shelters, patios enjoy a nice reputation in the heart of offices. Highly appreciated for their ability to retain freshness and preserve spaces from wind, the patios of Foyer SA offices are articulated around three spaces: a patio in the lobby and a narrow and a large patios on the 1st floor. More intimate than a terrace and smaller than a garden, these open central courtyards bring light and nature to the workspaces. We designed real outdoor rooms by creating vanishing points with the plants reflection on the building walls and playing on the perspectives by alternating plants of different heights.